In 2017, global carbon emissions climbed to a record high. Just this month, a report was released by the United Nations urgently warning that in order to prevent further increased global warming, dramatic steps were going to need to be taken. They estimated that human activities have caused an increase of 33.8°F of global warming compared to pre-industrial levels. If this continues at the current rate, as 2017 data indicates, it could reach an increase of 34.7°F by as early as 2030! So what does this change in temperature mean, exactly? Well, scientists have high confidence that not only who this create an increase in mean temperature, but hot extremes, a probability of increased drought, decreased precipitation, and an increase in sea level. Further impacts due to these considerations include an increase in wildfires and destruction of homes and habitats, species loss and extinction, and risks to health, livelihood, and food and water sustainability. That sounds terrifying. What can I do? To halt climate change at the current rate, it is going to take not only a national movement but a grassroots acceptance and lifestyle changes. We’ve put together a list of things you can do within your daily life to help mitigate climate change on a local level – share, tell your friends, and together we can make being green a popular choice. Fossil fuel use is one of the largest human contributors to global warming. Stop and consider the difference in emissions if every person who owned a car changed over to an electric or hybrid vehicle, ride-shared, or choose energy-efficient public transportation. While this may not be a cost-effective avenue for you just yet, take a look at the affordability of electric transportation. It’s rapidly declining, while vehicle styles are becoming popular choices for urban and suburban professionals. Don’t get us wrong here. Diet is not only a health choice but a very personal consideration at that. We can certainly appreciate a good Juicy Lucy here in Minnesota. However, land-intensive animal products and processing use a fair share of consumables. Consider a plant-based diet, grow a backyard garden, and eat local to help reduce your eating imprint on the world. A significant section of the UN report focused on renewable energy use. Their staggering requirement: that renewable energy account for 85% of electricity production by 2050, with gas energy being just 8% and coal at 0%. Solar, wind, and electrical technologies have improved significantly the last decade, but are still vastly underutilized due to the societal, economic and political pressures by large industries. At home, consider solar panels for energy generation and reach out to your local energy co-op for sustainable options. On a larger scale, step back and consider your investment choices. Do you know where your 401k investments are held and who they are funding? Most traditional 401ks do not support ESG (economic, social and governance) rated social investments. Rather, most focus on the very large scale businesses that are contributing to climate change with non-sustainable business practices. Our environmental portfolio is made up of companies addressing their long-term environmental impacts, focusing on sustainable business practices, and prioritizing their effect on the surrounding environment – at a local and national level. At Invested Interests, we believe that a national conversation regarding the truth about climate change needs to be brought to light, across party lines, for the good of our lives and the lives of future generations. 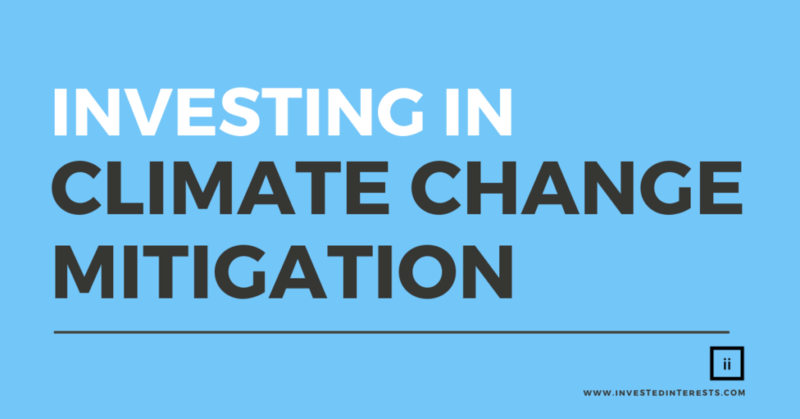 Questions about our climate change or environmental investment portfolios? Ready to get started with no minimum investment? Request a FREE impact investment consultation, and we’ll be in touch!